With another day of visiting family, we were not in control of our own destiny - where we were going to eat for dinner. Yah, it's not like we can just force our relatives to eat where we want to eat! 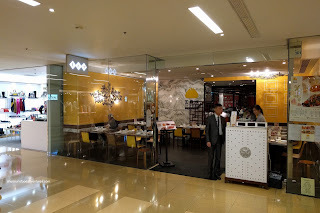 So we ended up at Wang Jia Sha in the City Plaza Mall in Tai Koo Sing. For those familiar with the mall, it has a ice skating rink in the middle. Just watching people skating there made me really want to lace them up myself! Nah, they were actually quite good and I guess I shouldn't have assumed no one could skate in HK! Onto the dinner, we had a feast which included Braised Slices of Beef Shank. 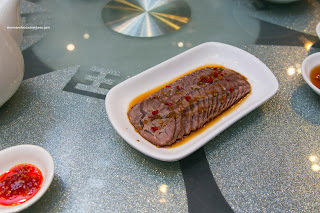 This was pretty typical with thin slices of fairly tender beef that was a touch dry in spots. The flavours were balanced though not being too salty nor sweet with the background hit of five-spice. We also had the Wine-Marinated Chicken that was mostly dry and chewy. Even though this was free-range chicken, it shouldn't have been this way. The skin was nicely gelatinized though and the wine had penetrated the meat. With that being said, it wasn't really that strong either. Next up was the Mung Bean Noodles with chicken, cucumber and sesame dressing. This was a pleasing dish where the noodles were buttery soft with a slight rebound. There was more than enough tender chicken and cucumbers to go around. However, the amount of sesame dressing (even thought it seemed like a lot) was insufficient to provide an impact. It was nutty and slightly sweet. 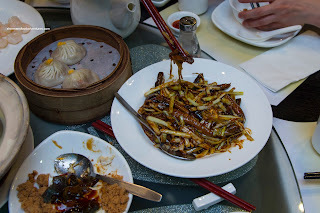 Although being a simple dish, I really enjoyed the Century Egg with tofu and pork fluff. 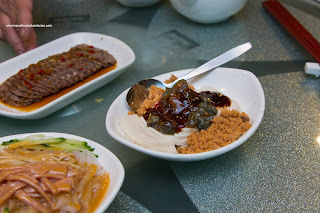 The soft and silky tofu was topped with enough nutty century egg and pork fluff so that it was tasty. The sauce wasn't too salty either. 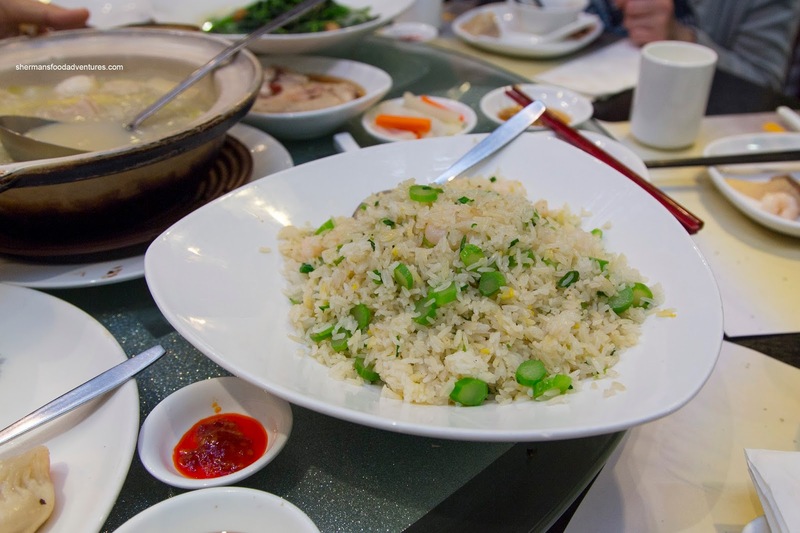 Looking quite simple, the Stir Fried Shrimp was a pleasing dish. 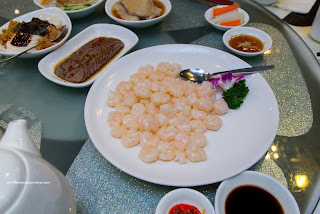 It featured small shrimp (weird saying that) that were buttery with a cold-water snap and just cooked through. The light glaze was sweet and only a touch salty. I liked how there wasn't much moisture on the plate which meant the wok heat was enough. 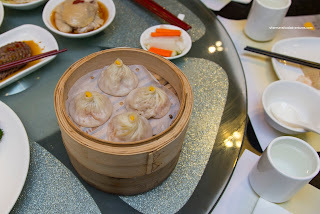 For the second time this trip, we had Xiao Long Bao, but this time with crab. 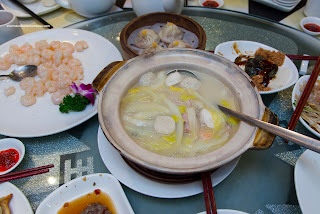 It was super apparent when we bit into it as the soup was briny, seafoody and sweet. The filling was fairly moist and tender while the dumpling skin was thin except for the top twirl. 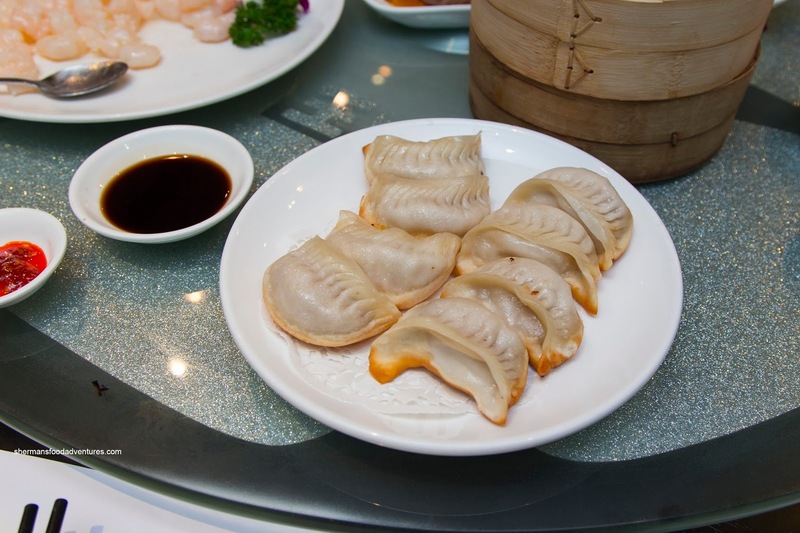 We didn't end there with the dumplings as we got the Potstickers that featured a crunchy and well-browned bottom. 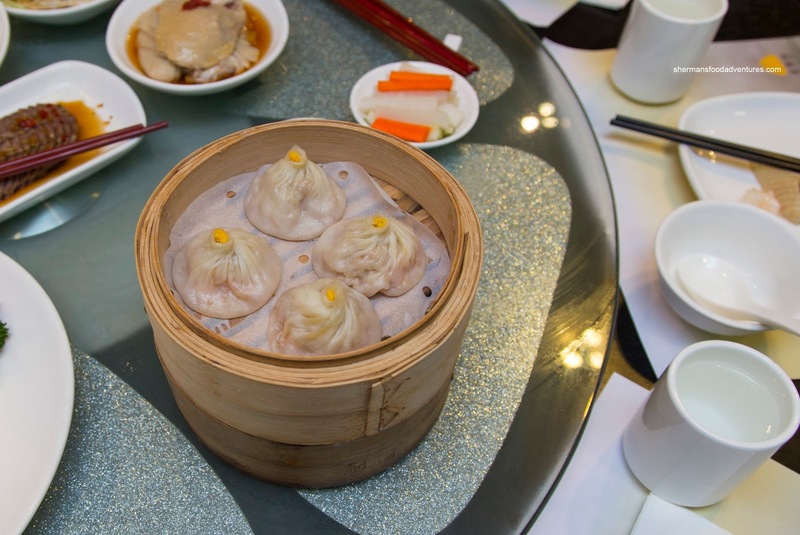 The dumpling skin was medium-to-thick thickness and was soft with an appealing chewiness. Inside, the filling was tender, held together well and did not feature any fillers like too much veg. 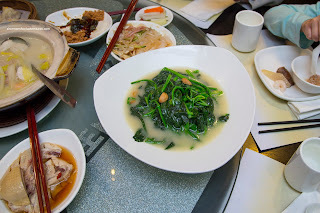 Now the next dish was all veg in the Sauteed Spinach in consomme with fried garlic. As expected, the flavours were more subtle here where the garlic was necessary to add some punch. Even though it was sitting in broth, the spinach wasn't mushy while the flavours did penetrate. Bathed in a good amount of sweet sauce, the Stir-Fried Eel with flowering chives was a study in textures. 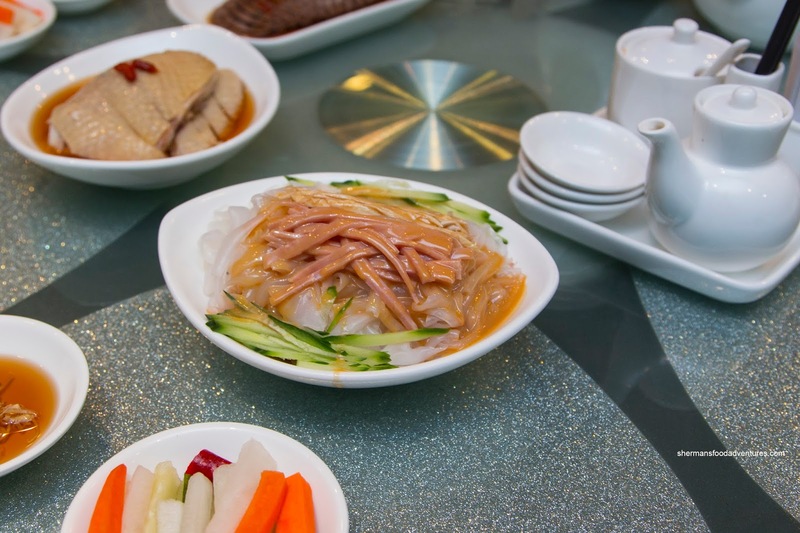 The gelatinous skin of the eel made things buttery and soft. There was plenty of it as they didn't skimp. The plethora of just cooked flowering chives added both a crunch and a certain brightness to the otherwise heavy dish. On the lighter side, we had the Vermicelli with Napa Cabbage Hot Pot with pork belly, squid meatballs, dumplings and mushroom. However, it was completely over-seasoned being pretty salty. On the other hand, the amount of ingredients did dissipate the saltiness. Aromatic from the stir-fry of oil, peppers and snow cabbage, the Fried Chicken was pretty flavourful. On its own, it wouldn't have been that impactful if it weren't for the flavoured oil on top. Despite the dark meat being tender and buttery, the white meat was dry and slightly chewy. 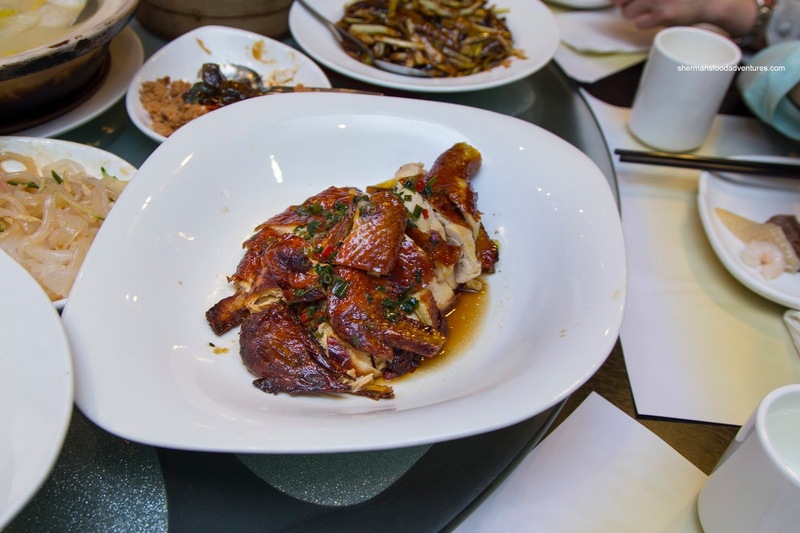 The richly hued skin was nicely rendered where it was a touch crispy and edible without being heavy. 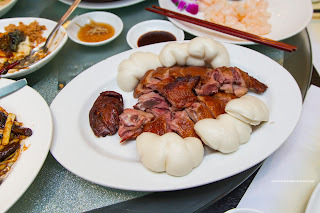 I thought the Smoked Duck with bao was pretty decent featuring a light smoke and just enough salt. The meat was a tad dry and chewy though while the skin was mostly rendered. It went well with the fluffy bao on the side. We ended things off with a Fried Rice with gai lan stalks. It was chewy, nutty and not overly greasy. The ample amount of veg helped add a nice crunch. However, there was far too much salt as each spoonful required some tea to water it down. For dessert, we had the Deep Fried Red Bean Pastry. 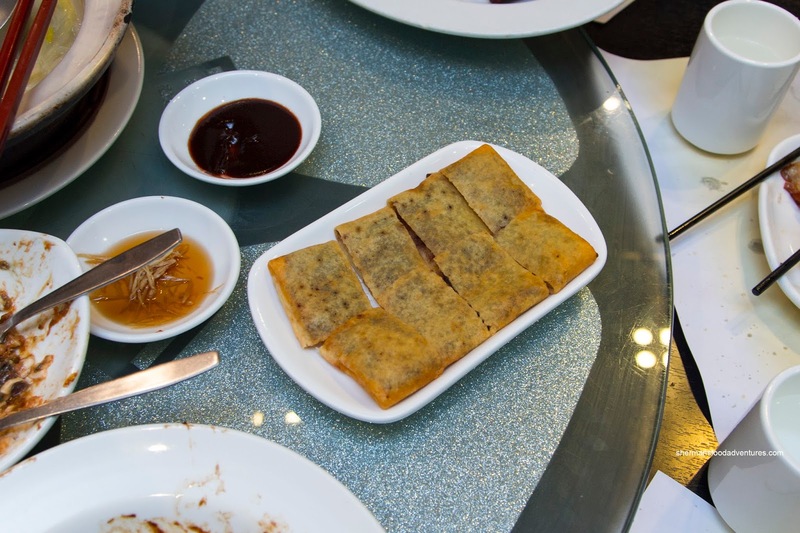 Featuring what was essentially spring roll wrapper as the outside, the whole thing was pretty crispy, albeit oily. Inside, the red bean paste was predictably sweet. It was pretty much standard for this type of dessert. In fact, I found the food pretty typical for a chain restaurant. It is definitely serviceable but not super memorable. 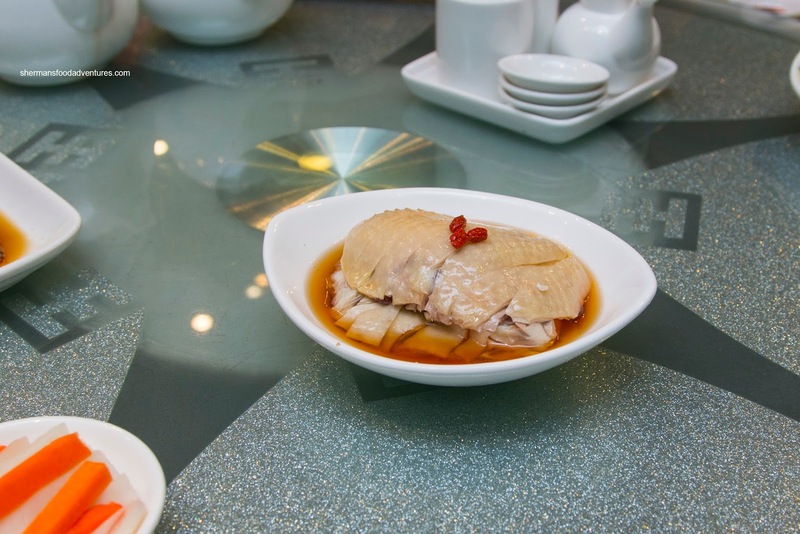 But if you want a convenient location and predictable food, Wong Jia Sha fits the bill.